November was off to a mild start, but winter is coming. Icy winds from Scandinavia are slowly rolling in, bringing snow to some parts. Areas spared the snow could be hit with heavy rain and sleet - but where will the Arctic blast hit this week? Steven Keates, of the Met Office, said: "It's going to be colder than what we've been used to, obviously, considering it's been balmy and mild as a whole. "There's going to be a day by day cooling off, with each day getting cooler than the previous. "There will be some cloud and showers, but the biting wind will make it feel even colder than it is, particularly in the east. He added: "West is best in terms of the weather this week. There could be some snowfall in the more mountainous areas, the peaks, but we shouldn't expect too much disruption. "It's going to be quite a shock to the system." 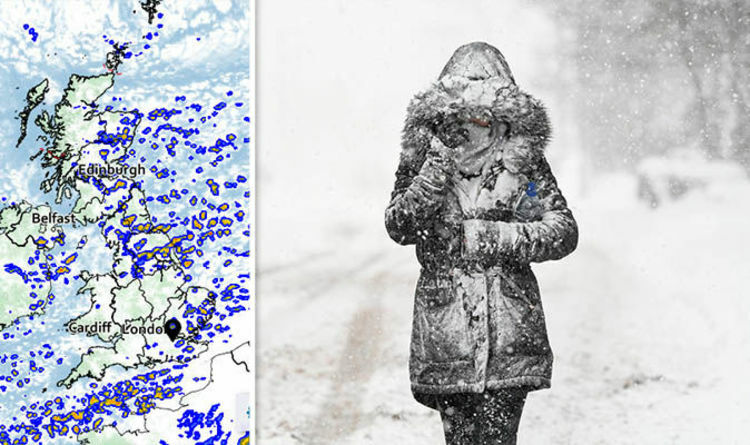 The snow is forecast to hit Britain on Tuesday, according to the Met Office. Most of the snow will be further north, particularly hilly regions, as you can see from the snow radar map below. As the week progresses, easterly winds will gradually ease. But heavy scattered showers will continue, with hail, hill snow and a risk of ice. An easterly wind is driving the temperatures down - rivalling even Reykjavik (5C), experts said. The November average for England and Wales is 10C. Some heavy showers are also likely to turn snowy across central and eastern areas, including Lincs and the Chilterns. The expected snowfall is unlikely to accumulate or cause any major travel disruption, said the Met Office, and no weather warnings are in place. Mr Keates said: "It won't feel particularly pleasant out there. It's typical cold near-Winter weather with overnight frosts and ice." Britain was hit by the worst snowstorms in 30 years last winter, dubbed the ‘Beast from the East’. Through the rest of November, there will often be cloudy skies with the likelihood of some showers, which may bring hill snow in the north of the UK. There will be some sunny spells too, said the Met Office, although the breeze will make for a marked wind chill at times, especially in the south and west where there may be gales in exposed areas. Temperatures will remain on the chilly side, with patchy frost or ice likely at night. Into early December, there is a lot of uncertainty in the forecast, as there is the chance of either a short-lived milder spell with winds from the west, or perhaps seeing even colder conditions if the winds turn more northerly or northeasterly.